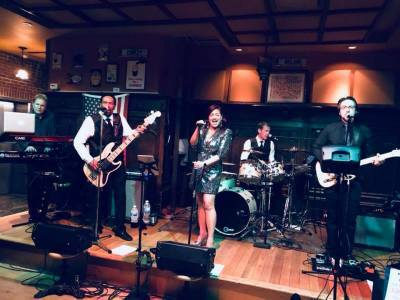 SERIOUS JACK IS A HIGH ENERGY PARTY BAND THAT PERFORMS A VARIETY OF ROCK, POP, FUNK, AND COUNTRY MUSIC FROM THE 60'S TO THE CURRENT TOP 40. COMPLIMENTED BY AN EXCITING LIGHT SHOW AND STATE OF THE ART SOUND REINFORCEMENT, SERIOUS JACK IS A SELF-CONTAINED ACT THAT HAS ELECTRIFIED AUDIENCES OF ALL AGES FOR THE PAST 12 YEARS. THE ENSEMBLE IS PROFESSIONAL, APPROACHABLE AND FLEXIBLE. THEY ARE AS COMFORTABLE PLAYING AT THE BACKYARD WEDDING AS THEY ARE BRINGING DOWN THE HOUSE IN A CONCERT SETTING. 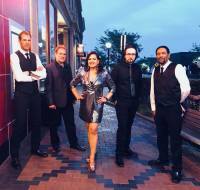 SERIOUS JACK FEATURES A DYNAMIC FEMALE VOCALIST BACKED BY THE FINEST MICHIGAN AREA MUSICIANS. EACH MEMBER HAS THEIR OWN UNIQUE VOCAL STYLE WHICH LENDS ITSELF TO A WIDE RANGE OF MATERIAL AND GREAT VOCAL HARMONY. ALL OF THE GROUP MEMBERS HAVE EXTENSIVE EXPERIENCE TOURING WITH A VARIETY OF NATIONAL ARTISTS SUCH AS ANNE MURRAY, THE DRIFTERS, THE TEMPTATIONS, BOB SEGER, EDDIE MONEY, AND MANY MORE.